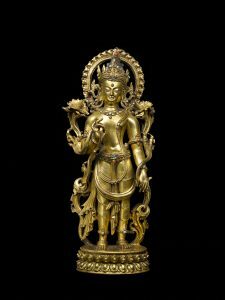 Carlton Rochell is one of the leading dealers in the world in Buddhist masterworks from Tibet and Nepal. Since its founding in 2002, Carlton Rochell Asian Art has handled important works of art from renowned collections including Mr. and Mrs. Jack Zimmerman, Dr. David R. Nalin, and Wesley and Carolyn Halpert. Mr. Rochell has sold to well-known institutions in the field as well as to distinguished private collectors. Carlton Rochell spent the first 18 years of his career at Sotheby’s, where he founded the Indian and Southeast Asian Art Department in 1988. Later, he became the Managing Director of Sotheby’s China and Southeast Asia and Head of the Sotheby’s Asian Departments worldwide, as well as a highly regarded auctioneer.